Are you looking for dog flea collar for your pooch? If yes, then this post is the right place to explore the information on the same. Your four-legged friend gets irritated with ticks and fleas as they can spread diseases from one doggie to another which prove to be unsafe for your dear pets. The flea and tick collar will provide safe and comfortable life to your valuable pooch. Different types of dog collars are available on the market. Here I will make you accustomed to the reviews of Seresto dog collar which is considered one of the famous flea and tick collars. Let’s move ahead to discover the details. In 24 hours the collar can kill the fleas as it is smeared with unscented insecticide. Your pooch can keep on wearing the collar at the time of swimming or bathing as it is waterproof. For eight months you don’t have to buy the new collar for your beloved pooch as this scent free collar has constant release technology that releases the active ingredients into the fur and the skin of your dog that finally distributes to the whole body. The two active ingredients included in Seresto collar are Imidacloprid and Flumethrin. The former element kills the fleas and flea larvae while the latter helps in repelling and killing ticks. Water resistant- If it is exposed to shampoos, swimming or rain then its efficacy is still maintained and enjoyed. Speedy Working- After application, the collar starts working on the body of your precious pet. Release mechanism- If your pet is stuck and caught in something then the collar is released from the neck due to break away release mechanism. Reflector clips- During the night you can have the visibility of your pooch with the help of reflector clips. After going through the features, I will throw light on the benefits and drawbacks of the Seresto dog collar. Different sizes of collars are available in the market. Offer services for eight months so you don’t have to worry about getting it frequently changes as it will provide safety for the insured period. It is waterproof and scent proof. Your pooch can comfortably swim and take a bath while wearing this device. On wearing Seresto collar, the infection risk is reduced as it is effective and operational. The quick release mechanism is activated when your canine gets trapped. Your pet will enjoy it as it not too bulky. It is strong enough to provide you useful results. Comparatively, Seresto collars are reasonable to other brands of dog collars so you can save your money. Every aspect has two sides – one is positive, and the other is negative. After discussing the positive points, I will talk about the drawbacks. After eight months its effectiveness will be lost. It won’t be proved good for the canines that are sensitive to some pesticides. In first few days of the wear, you have to check that your pet has not removed it. To enjoy effective results, it has to be worn correctly. The dogs with longer hair breeds may not experience effective results. Though it is waterproof, still you don’t expose it to water too often as there may be chances of losing effectiveness. Is Seresto safe for humans? 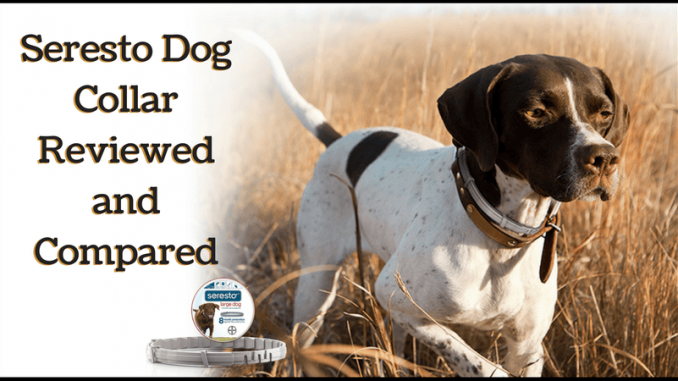 Off Course, Seresto Dog collar is safe for humans, pets, and environment too. This device has undergone the test and proved to be safe for your valued pets. From 10 weeks of age, you can make use of it on the kittens and from 7 weeks of age on the puppies. In case your canine gets trapped then the safety release mechanism gets triggered. Within the collar matrix, the active ingredients are stored. The release of elements is maintained by the dose-adjustment system which is confirmed by the controlled-release technology. You will not observe hostile side effects of Seresto flea and tick collar. Maybe you notice slight hair loss and mild skin irritation. 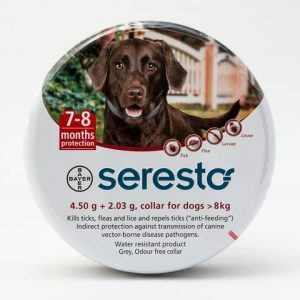 There may be mild gastrointestinal issues if the collar is ingested by your pet.Overall the studies reveal that there are no significant side effects of Seresto flea and tick collar. Relatively Seresto dog collar will serve you best due to its low maintenance and high efficiency. You can make use of this device for your kittens and older dogs. It will kill the fleas and ticks which in turn will save the health of your beloved pooch. Your pet can enjoy the comfortable stay but make sure after eight months you get it changed. Check that collar does not cause any irritation to your dear pet, and he feels comfortable on wearing it. Let him enjoy the stay free from fleas and ticks.